My baby was the one you could hear from down the hall. Doors all along the hallway of the Mother-Baby Unit shut as the nurse brought 5 pounds and 2 ounces of scrawny, screaming irritation back to me once again. After a physically uneventful but emotionally draining year, I was completely unprepared for a premature birth, forced labor and botched delivery. Apparently baby was not ready, either. It was weeks before I could sit down, months before I could sit down without pain. Days before baby could latch on, weeks before he wanted to latch. I tried to cook and clean for my patient husband, our new marriage trapped in non-verbal infancy and the frustration of novelty: diapers, dryer vents, drugstores, dirt. Nights were measured in one-hour intervals. Days ran into one another strung together by the constant motion of bouncing, moving, swaying, walking around and around in circles on my carpet path. Housebound by doctors’ orders and winter storms I sometimes wore earplugs to dull the constant crying until I, too, became dull. In my more lucid moments, I thought this must be punishment for unplanned pregnancy. No friends, no network, no family and no peace. I never registered for baby things thanks to the kind lady at the Pregnancy Center who gave me a crib, a stroller and some maternity clothes. Lacking a periodical subscription, a Babies R Us and an internet connection, I did not hear the term “Postpartum Depression” until well after the postpartum stage. Books lived on the nightstands, on the counters, on the edge of the crib. Straight lines of text balanced the erratic daily mood swings, until they joined one day in a black-and-white picture book from 1961 entitled Children and their Mothers. Grainy photos of black and white skin, poverty and prosperity, new world, old world, third world glared starkly in the glow of my nightlight. Mothers from around the world, sad and happy, eating, healing, resting, nursing, working, starving, dying. In homes, hospitals, clinics, hovels and ditches. But the babies! The babies were content, peaceful, unaware of their circumstances. And for every sleepy, drooly, placid baby there was a piece of cloth, a basket, a scarf, a pack which held them up high on their mother’s body. In the morning, after my tired husband left for work, I took a flat sheet and ripped it in half longwise. Looking in the mirror for perhaps the first time in weeks, I tried to tie a band around my body, wrapping the length and width around mummy-like. I looked at the tiny body clawing at his blanket on my bed and then at the quantity of fabric wrapped around my middle. Looked at the picture of the African mamas washing, sewing, cleaning socializing with babies on their backs. Unwound the sheet and picked up now-frantic baby … and stuffed him feet-first into the top of my sports bra. This became our morning exercise routine. Daddy leave for work. Baby wake up again. Mommy frantically strip her shirt off and nurse angry baby, then stuff him semi-upright in her bra and begin walking our carpet path. After a few days, baby quieted after only minutes of protest, dosing in his tight elastic nest on top of mommy’s chest, all his bony arms and legs folded in, securely held. After a few weeks I got braver. I knew how to do something! I could cook, I could clean, I could help my baby feel better, if only for a few hours. We got braver as the weather worsened and nights began before dinnertime. I half-expected to be stopped by a police car on our first walk around the block. Ma’am, what is that lump under your coat? Just a sleeping baby, warm in his swaddling of shirts and scarves, only the top of his hat visible under my chin. Deep snow, deeper quiet, an hours’ respite from fighting our housebound demons. By spring baby had outgrown his nest. A new internet connection brought news of warmer weather, lists of garage sales and links to baby stores. I dragged out a used Snugli and diaper-pinned the straps back on. Baby objected to this new, open-air insecurity. What luck when I found a “real” sling at Walmart! It was huge--I pushed and pulled the padding through the rings, removed stitching, chopped ends and generally mangled it into submission. Miles, weeks and two aching shoulders later, I found a new website. 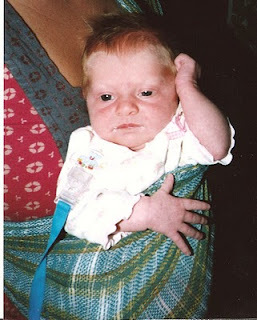 La Leche League led to Jenrose led to Jan Andrea led to my sewing machine and finally a simple pouch sling emerged. We went to the grocery store together, baby, the pouch, and I. The white people stared, the gentleman in the milk aisle shook his head. But the old Mexican lady buying bushels of tomatoes adjusted the stretch of fabric across my back with a gap-toothed smile and tucked the edges under baby’s knees. The deli girl told me of her grandmother and her country as plastic-gloved hands mimed tying straps and tucking fabric. “Rebozo?” I asked my Spanish-speaking mother a few weeks later. Doubtful about my invention, she was heartened by my combed hair and babbling baby. The wall between us cast shadows in either direction, baby rising every day, the noon sun of compromise. A few months later she returned from a missions trip, thinned and warmed by hotter climate. She handed me two strips of brightly woven cloth with fringe at the ends. The weave was open, the cotton soft and flexible. Meshlike, the scarves stretched and curved around the curve of baby’s peeking face. Marion Scott is wife to a patient man, mother to four youngsters and designer of the CatBird Baby Pikkolo. A babywearing pioneer of sorts here in the area, she's been wearing her babies intermittently for the past ten years, well before many slings were readily available on the market. She is the liaison for Babywearing International of Chicagoland, our local babywearing group. I'm proud to call her a babywearing mentor and friend.